So you're feeling a little ostracized, are you? It's alright. Plenty of artistic geniuses and mad scientists often get excluded from cookie-cutter suburbia. Frankenstein and his monster were run out of town quite quickly. No one appreciated Dracula's tastes. 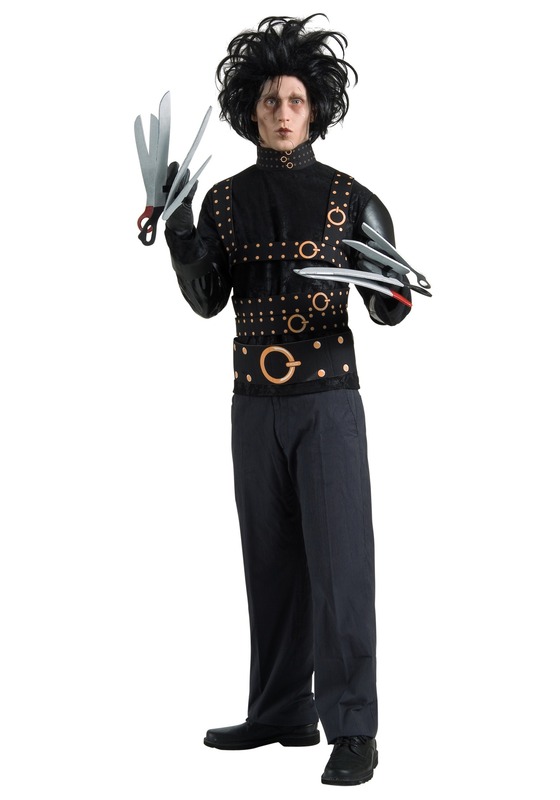 And here we have Edward Scissorhands. He tried to fit in but he couldn't. Maybe it was because of his mad slicing skills. Maybe it's because he didn't socialize well with all of the housewives. Maybe it's because he could never put his hands in is pockets. Regardless, many famous creative minds didn't fit in when it came to "normal" people. Personally? We think that's excellent. Life is far too boring if everyone acts and thinks the same. Following proper etiquette? Boring! If everyone dresses in the same styles, has the same hair and make-up, and has their tea the same way, they may as well be a clone army. But you, you're out to be different, aren't you? You stand out from a crowd with your strange skills and unique look. That's fantastic. We hope other people will one day feel the same. Maybe they will in our Edward Scissorhands Costume. It's got the jacket with faux leather accents, gloves with foam scissor fingers and a black wig to look like our dear eccentric Edward himself. In this outfit, they will feel like the creative tortured soul we all know and love. Then they can feel and look just like us!